Miguel said: "La Mar de Letras is a small but nice children's bookstore." The name of this bookstore can be loosely translated as "The Sea of Letters" and to stick with this metaphor, this bookstore is definitely a ship which will ensure a safe and entertaining journey for all the kids on board. The offer of this bookstore is aimed primarily at kids and juveniles, but parents will also find some interesting reading material. The stock holds more than 15 thousand books for kids and juveniles and over 3 thousand books about parenting. You can find a wide selection of books ordered into several categories with the age target group ranging from just several months to teenagers. The offer of books for adults mainly consists of books which focus on pregnancy, baby care and parenting in general, but you can also find titles about nutrition, healthy lifestyle or ecology, education, history of children's literature, psychology. Although the majority of the books is available in Spanish, you can also find titles in English and we decided to include this bookstore in our guide as a noteworthy place especially for expat families with kids in Madrid. The activities of La Mar de Letras go well beyond the scope of a usual bookstore. This bookstore is a place where all sorts of events connected with kids literature and mainly with promoting reading among children take place. Weekly readings of books for kids (each time a different age group) are on the program each Saturday, different workshops or storytelling meetings are also frequent. La Mar de Letras also has a very nice, informative and obviously frequently updated website, which proves their dedication to the their work. Our only reproach is that the contents of the website are only available in Spanish. Situated in the center of Madrid between la Plaza Mayor and la Plaza de Oriente. 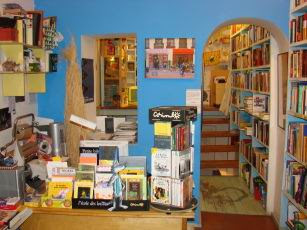 In 2007 this bookstore was awarded the prize "Premio Librero Cultural", which also shows that their efforts are being noticed. This bookstore is worth a visit thanks to its unique interior as well, since it is adjusted to the interests and needs of the majority of its visitors - that is why toys are a part of the decoration.